The controversial Tai Dang house in Rockaway.\Photo by Scott Gilbert. We are nearing the endgame of a years-long struggle to prevent the riprapping of a structure in Rockaway Beach that never should have been built. The owner’s application to make permanent the temporary riprap he has already been allowed is the final opportunity to block shoreline armoring for the property and protect the integrity of Statewide Planning Goal 18. A public hearing will be held if there are at least 10 requests by 5 p.m. on April 15. It is also possible to comment for or against the proposal without requesting a hearing. If requesting a hearing, it is important to state a reason. Comments or requests should be sent by mail to Calum Stevenson, Oregon Parks and Recreation Department, 12735 N.W. Pacific Coast Highway, Seal Rock, OR 97376, or via e-mail to [email protected]. The comments most recently submitted by Oregon Shores regarding this ongoing issue may be viewed here. At one point it appeared that owner Tai Dang’s attempts to armor the shoreline to protect his house at 211 S. 6th St. had been successfully thwarted. The City of Rockaway Beach refused to certify that his property qualified for armoring in accordance with the city’s comprehensive plan, and State Parks followed by denying his application to intrude on the public shoreline with a riprap structure. However, Dang successfully sued the city, which was forced to accept that the property qualified for riprap, whereupon, in January, State Parks granted him permission to install a temporary 81-foot-long wall of riprap. He is now applying to make that “emergency” permit permanent. The issue now is whether the city’s error in originally granting Dang a permit outweighs the public’s right to preserve its shoreline, which would be damaged by the shoreline armoring for a building that should not have been allowed in the first place. There is no question that the structure is severely threatened; the question is whether a developer can in effect play chicken with the authorities, building in a foolish location in violation of all setback provisions and then daring them to allow the vulnerable structure to collapse. The case has a long, convoluted history stretching back several years. Developer Dang (and two partners) built the structure very close to the edge. It is used as a short-term vacation rental—a “party house,” according to unhappy neighbors—and so Dang and his partners wanted the maximum proximity to the beach. The location clearly violated the city’s beach setback ordinance. However, a part-time planner with the city, using absurd logic that made a mockery of the city’s clear intentions under its comprehensive plan, granted a permit. 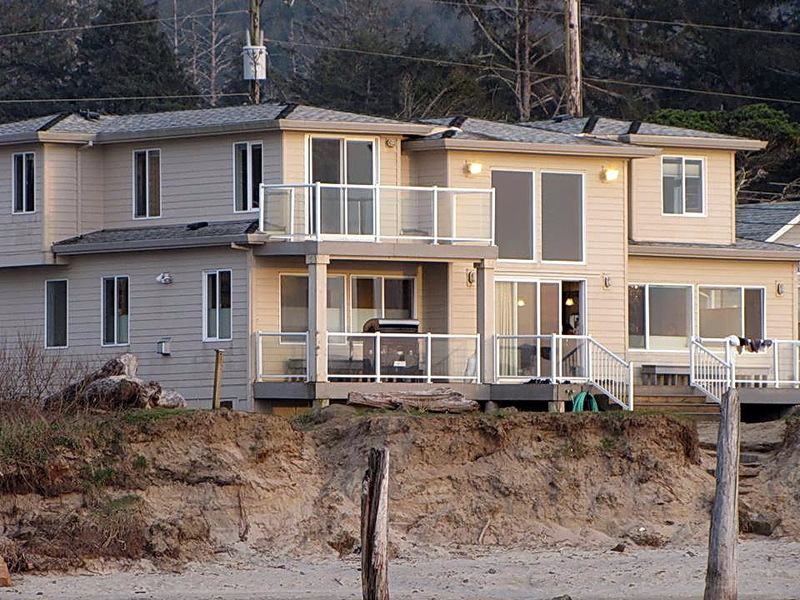 When Dang subsequently applied for a permit to riprap the structure, because the low dune it is built on was rapidly eroding (which is why it should never have been built), the city refused to authorize shoreline armoring because a new, more diligent planner, realized that the house’s location violated the land use plan. State Parks, which grants permits for shoreline protection structures (such as riprap) which extend onto the public shoreline, turned him down on the basis of the city’s decision. Oregon Shores opposed the application before both the city and State Parks. When both denied the permit, Oregon Shores supported the city and state through Mr. Dang’s appeals to the courts, which were initially unsuccessful. However, Dang and his attorneys took a different legal tack, and this time succeeded on the grounds that his house had been permitted, even if erroneously. State Parks (the Oregon Parks and Recreation Department), which manages Oregon’s public shoreline, is charged with issuing permits based on its own regulations and on consistency with statewide planning goals. Goal 18 of Oregon’s land use planning laws requires that to qualify for shoreline protection, a property must have been developed before 1977 (although there is provision for emergency permits when more recent structures are threatened). State Parks defines “developed” as meaning that utilities were extended to the street where a parcel is located by that year; opponents of riprap proposals are often surprised to find that lots that were vacant until recently nevertheless qualify for riprap under this interpretation. The house in question was built long after 1977, but might have qualified as being on a developed lot. However, when Oregon Shores requested a hearing on the original application, the City of Rockaway Beach retracted its initial determination that the project was consistent with its comprehensive plan and zoning ordinance. While the threat to the house from erosion is real, if the house was constructed in a location that violated the city’s plan, it would not qualify for protection. When built, the house was to be located behind the city’s Ocean Setback Line, which would have qualified it as conforming with Rockaway’s Goal 18 “exception area.” It now appears, according to the city’s administrative decision, that the house was built much closer to the edge than the smaller structure it was to replace. Erosion would not currently be a threat if it had been built on the location the city thought it was approving. This is the matter that the applicant successfully appealed, and gained a court decision on narrow property rights grounds rather than the public interest. No one questions that erosion threatens the house, but Oregon Shores members and other opponents argue that the public shouldn’t lose part of its beach to protect a structure that should not have been built in that location. Moreover, neighbors are concerned that an armored shoreline in front of this lot will deflect waves and cause erosion on neighboring properties (including a public beach access) and possibly further up Saltair Creek. Testimony against the application at the OPRD hearing three years ago by knowledgeable local residents was solidly factual and credible, and might have been sufficient to persuade OPRD to deny the proposal even without the city’s decision that the property didn’t qualify. The application can be viewed here. While Dang and the other owners did receive permission to install temporary riprap on an emergency basis in the wake of the court decision, the current application process before State Parks presents an opportunity to make the case that the public interest, and the potential damage to neighbors, should prevail over the error that allowed the structure to be placed in this foolish location. Oregon Shores is requesting a hearing, and will continue to work to protect this stretch of shoreline from armoring, and to preserve the integrity of Goal 18.